A roof is vulnerable to numerous elements, some man made and some natural. High winds, torrential rain, snow, scorching rays of the sun, debris of several kinds, birds and animals, branches of trees and growth of mold or algae, poor ventilation, improper installation, moisture inflicted problems, water damage and structural problems; all can have an impact on the roof in your property. As a property owner, you must be aware of the potential or existing problems in your roof. The only way to do so is to keep an eye on the roof and to watch out for warning signs of a failing roof system. When you install a new roof or after a roofing contractor is done, you must inspect the roof. If you notice anything out of place, looking odd, protruding or caved in, any unusual spots or marks, any sign that troubles you, then you should get your roofing contractor to look at the concern before they leave your property. Many problems in roofs are set in motion right from the installation process. It isn’t that all roofers are incapable of perfect installation but there is always room for errors. This is also why you should only hire the best roofers in your town. Some of the most common warning signs of a failing roof system are physical damage to the roof, signs that can be easily seen with a naked eye without any professional expertise or knowledge about roofing. You should pay periodic visits to your roof, just to look out for these warning signs. DAMAGED FLASHING May occur due to improper installation, weathering or settling of the home’s foundation. Flashing problems are among the major causes of roof leaks. CEILING SPOTS Caused by roof leaks. The source of the leak may be detected by an inspection in your attic. MISSING SHINGLE GRANULES Bare spots on your shingles or an excessive amount of granules in your eavestroughs. BLISTERS Excess moisture in your shingles, caused by poor drainage or inadequate ventilation, can cause shingles to blister. SHINGLE BUCKLING Buckling of shingles may be caused by poorly installed underlayment, poor attic ventilation or when new shingles have been installed over shingles. MISSING SHINGLES Improper nailing or high winds can cause shingles to fall off. ALGAE OR MOSS GROWTH Large trees near your roof can provide an ideal growing climate for moss or algae. ROTTING Excess moisture absorption and retention can cause shingles to rot. All these are signs that the roof is damaged and it is failing. You must immediately call in an expert and get your roof check out and attended to. 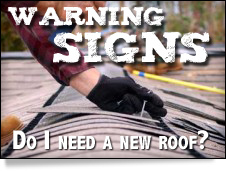 There are some other warning signs of a failing roof system. You should check your energy bills if they have surged northwards for no reason. That may happen due to failing insulation which could be a problem with the insulating material but often is a problem with the roof that is letting heat or cold out of the attic. Likewise, if your attic or the uppermost floor is suffering from a lack of ventilation, chances are that there are some problems in the roof.